Another one of a kind project using an end-of-life iBook. My son and I gutted the machine, and took out everything we could leaving the empty shell. Using a Dremel I removed any part of the inside that was sharp or took up space. I then glued some soft fuzzy material inside to cradle the iPad and secured the two sides of the iBook together. I used some strong magnets and a small strap of leather to keep the iPad in the sleeve. Take a look at the video below to watch the magic happen! This entry was posted on Saturday, April 16th, 2011 at 5:14 pm	and is filed under Uncategorized. You can follow any responses to this entry through the RSS 2.0 feed. You can leave a response, or trackback from your own site. I love it and I am going to do a few for firends. Do you have any more pix/info on the inside, padding/materials used, and so on? I would LOVE to see more, and how did the LCD back fit on the bottom? Was it hard to line up? Easy? Looks like a flush fit after removal of the bottom plate. Yes? More!!! More! I want more info and pix please! Fantastic job and I applaud your creativity. A true Mac Creative. Thanks for the kind words! I didn’t take a lot of pictures during the building process for this project, as I was kind of winging it. 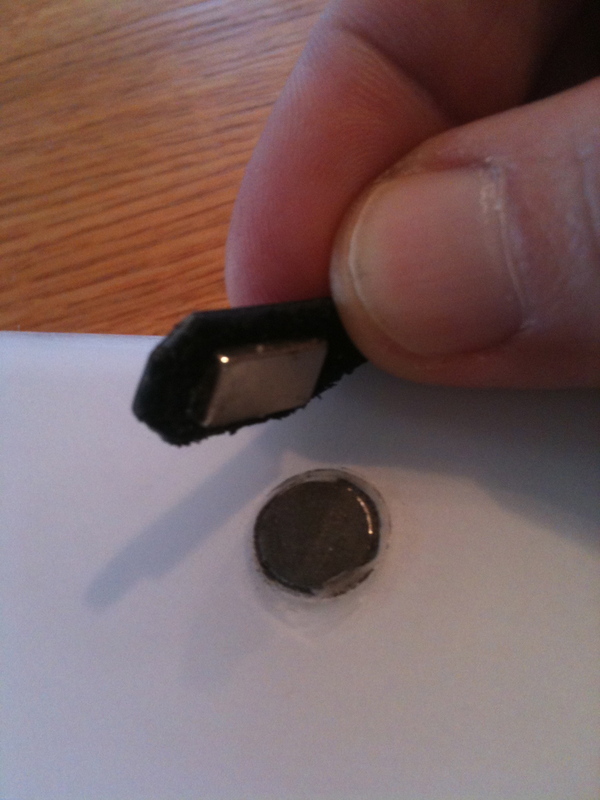 If you get ahold of a dead laptop, just start gutting away. Take out everything you can until you just have the frames left. When connecting the 2 sides together, I found that there wasn’t going to be enough room to hold the iPad (and optional smart cover) so I got some small thin pieces of pine at a craft store (the balsa wood was too soft) and used Gorilla glue to adhere them to the frame. For the inside I used some fabric samples from a couch we bought many years ago, but you could also use fabric from an old pair of shorts, or sweats (like I did for the 1945 iPad case you can find on my blog). 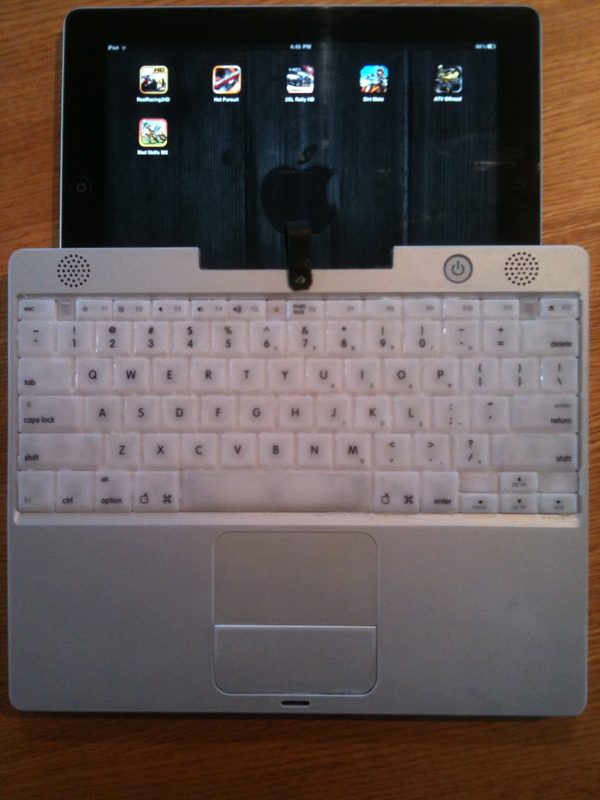 I also used some small soft foam to hold the iPad securely inside. It all lined up beautifully. I went over all the edges with fine sandpaper, and then covered up the showing wood with very thin white tape strips from a craft store. 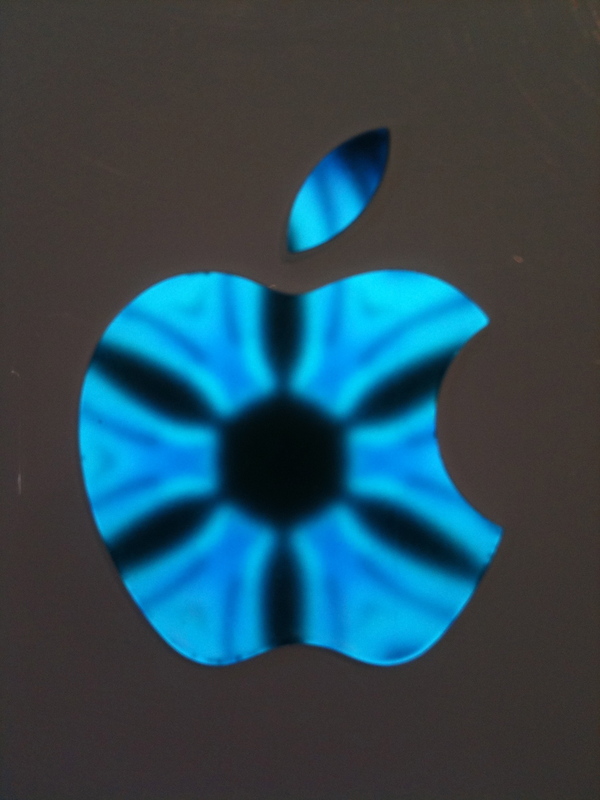 Finding out that the Apple logo was transparent was kind of a bonus, so I just cut that area out of the soft material so the screen could show through. If you’re feeling creative, take a look at the videos at personalmovietheater.com. Here you can download and build your own movie theaters to hold your iPhone or other media player, and make it look like an old classic movie theater or drive-in. If you make one, please send me some pics and I’ll post them on the site.